We will be tabling in Old Town Eureka for Arts Alive. 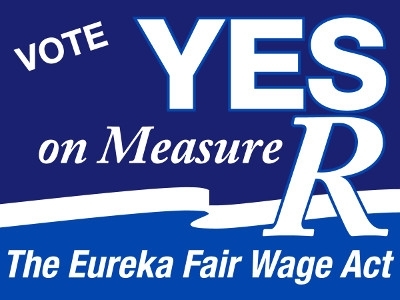 We will be gathering signatures for the Eureka Fair Wage Act ( $12.00 an hour minimum wage for large employers) and also doing voter registration for Arts Alive on Saturday, Sept. 1. We plan to be out from 6 pm til 9 pm. We will be at the southeast corner of 3rd and C St. kitty corner from Gallaghers and across from Chappala and the tattoo parlor. We may have a second crew at the Gazebo as well. Come down and sign the petition or register to vote, or both! We are also looking for volunteers to help with tabling, canvassing and support work. Your skill set is needed! Help us defend our community! Because attempts to increase the minimum wage are being met head on by the GOP talking point that doing so would cause employers to cut jobs and hours, the Massachusetts Budget and Policy Center looked at two decades of data in their recent report, The Minimum Wage and Job Creation. The study found that minimum wage increases have not had a negative effect on employment in New England. In Massachusetts alone, the minimum wage has increased six times since 1995. During this period, growth in industries with concentrations of high minimum wage earners has been higher than total employment. We Have Reached the Beginning! After much hard work with lots of help we have created the Eureka Fair Wage Act. Now the work begins in earnest. We will need all of you to take this idea from the basement of the Labor Temple to the pocket books of working people in Eureka. We need people to help gather signatures and to publicize the goals of the initiative. We need to gather 1500 signatures and we need to do it before the weather gets lousy at the end of October. This will be important to counter the power structure that is already lining up against us. The city right from the start has chosen to weaken our position by giving us the uninspired official ballot title of, “ Minimum Wage Ordinance”. The Fair Wage Act will require large employers. (25 or more employees) to pay a minimum of $12 per hour in the city of Eureka. We need $400 to pay for the publishing of the ordinance in the paper and we need to raise money to pay for the printing. We meet at the Labor Temple Tuesdays at 6:15 in the basement. Come by with your Ideas, your Energy and your Money. The place we love is under attack by corporate rapaciousness. They have come to take more of our resources. They want to log some of the oldest living trees on the planet to speed the destruction of our culture. The “Big Boxes”want to turn us into the company town With Walmart the company store. We are not going to go gentle into that good night. By forcing the large employers to check their exploitation of labor we can regain the momentum to protect what we value and strengthen the community in which we live. If you can’t make the meeting Email me,( radmul@aol.com) or call (707) 442-7465, we will find a way for you to help. It’s a big boost for millions of Americans and for our foundering grassroots economy, plus it comes with a powerful moral argument that makes it compelling to big majorities. Eighteen states have already raised their minimums above the federal level, eight of which have made future raises automatic by indexing the wage to rises in the cost of living. Among states considering raises this year, battles are being fought in Connecticut, Illinois, Missouri, New Jersey, and New York. Not only do labor and a host of progressive organizations back an increase, but so do thousands of businesses, ranging from Costco to local independents, as well as such associations as Business For a Fair Minimum Wage, the Greater New York Chamber of Commerce, and the US Women’s Chamber of Commerce. Many Republican lawmakers are on board for an increase–the 2007 bill raising the wage by $2.10 got the support of 82 House Republicans and five senators (not a huge number, but a significant bipartisan showing).